Why Did Top Brass Resign from Tanzania's Acacia Mining? If Tanzania lifts its gold export ban, Barrick Gold could pay a $300 million settlement to the government. Last Thursday, the firm said that it hoped for a final agreement in the first half of next year. Barrick said the $300 million would be paid from Acacia's cash flows, effectively pushing Tanzania to allow for gold exports. "Given Acacia's current financial position, these payments would be made over time, using Acacia's ongoing cash flows. As such, payment would be conditional on Acacia's ability to sell concentrate. Barrick will also be working with the government of Tanzania to establish the basis upon which the concentrate export ban can be lifted as expediently as possible, including protocols for joint oversight and verification of concentrate shipments," the firm said in a statement on Wednesday. A week ago, Acacia's chief finance officer Andrew Wray told analysts said that the firm doesn't have the ability to pay $300 million to Tanzania to resolve the tax dispute. The world's largest gold miner said that it was optimistic that its negotiating team and that from the Tanzanian government would work to complete detailed documentation and final agreements for review and approval by Acacia in the first half of 2018. 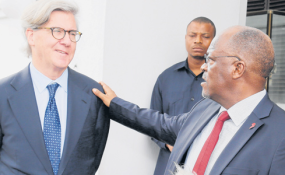 Barrick added that the agreement presented it with an opportunity to redefine Acacia's relationship with Tanzania for the long term, moving to a partnership characterised by trust and transparency. "We believe the proposed framework represents the optimal path for the resolution of outstanding disputes between Acacia and the government of Tanzania, and for the resumption of normal operations. Such a partnership has the potential to provide greater near-term certainty to Acacia and Barrick shareholders, and mitigate the risk of future business disruptions, thereby improving the long-term stability and sustainability of Acacia's operations in Tanzania," the firm said. The statements were in an earnings report from Barrick released recently which showed that the firm's earnings dropped from $278 million to $186 million, compared with the same quarter last year. The firm said the earnings were affected by Barrick making a tax provision of $172 million for outstanding claims against Acacia. In March, Tanzania accused Acacia Mining, of which Barrick holds 63.9 per cent, of understating its gold shipments. The government then banned the export of unprocessed minerals. The firm's operations affected by the ban accounted for about 6 per cent of Barrick's 2017 gold production forecast, which has now been revised downwards to between 5.3 million and 5.5 million ounces of gold from between 5.3 million ounces and 5.6 million ounces. The company reported a net loss of $11 million for the third quarter to September this year, compared with net earnings of $175 million in 2016. "The decrease in net earnings primarily reflects lower gold production and lower gold prices, as well as the impact of Tanzania's concentrate export ban on Acacia. Net earnings were also impacted by a tax provision of $172 million related to the proposed framework for Acacia's operations in Tanzania. The lower revenues, earnings, and cash flow for the quarter reflect lower gold production compared with the prior-year period, as well as the impact of lower sales from Acacia," Barrick said. Some shareholders have criticised the deal that Barrick struck with Tanzania, saying that it may have set the baseline for what nations will demand from global mining companies, possibly slowing mine development. In an interview with Reuters, Chris Mancini, an analyst at Gabelli Gold Fund, which owns shares in Barrick, said that the 50 per cent is not a good precedent for a risky business. "Miners would generally want more than half the profits from mines to give them the incentive to build operations in geopolitically risky parts of the world. They are disincentivising development. Barrick's really imperilling the rest of their operations. They are imperilling the industry," Mr Mancini said.